E-books are gradually becoming a part of our daily lives because of their ease and convenience. However, with the recent developments in the e-book reader landscape, confusion has arisen amongst readers. So, here's a guide to the best possible options for a good reading experience. The books are found in numerous formats among which, EPUB and MOBI stand out because of their availability and quality. KFS (Kindle Fire) from Amazon which is similar to EPUB format and AZW, an Amazon proprietary format which is very close to MOBI, are quite good as well. Created by Adobe for their Acrobat products, PDF format is possibly the most common one out there, however, the quality is not so good. Just like the formats, there is quite a range of apps for your androids, iPhones and iPads. Possibly Aldiko would be anyone's first choice. It is a versatile and feature-rich e-book reader for Android supporting EPUB and PDF formats as well as Adobe DRM encrypted e-books. Its interface is highly customisable and looks equally good on both tablet and Smartphone displays. You can purchase new books straight from the app, including best-sellers, new releases, and classics. Free eBooks are available as well. Another feature-rich app like Aldiko, Moon+ Reader enables you to read thousands of free e-books and supports almost all formats but has been criticised for crashing and short-lived customisation. Other similar products include Cool Reader and FBReader. Kindle, a popular name in the e-book world, provides readers a huge stock of books (both free and reasonably priced), newspapers and magazines, and allows them to customise the font size, screen brightness, background colour, etc. Recently though, the app has received bad reviews after an update. Most complaints state that the app has become slower or unresponsive. On the other hand, Kobo's recent update has not only improved it but added more praise to its name. It is highly customisable and user friendly. Besides its stock of 2.2 million new releases and bestsellers at great prices, it offers you 1.8 million free e-books. Another popular app, Nook has practically every feature you would want in an e-book reader. It has one of the largest stocks of books, magazines, newspapers and comics but for some people, the app has been causing problems. If you are into magazines, Zinio might be your choice. It offers you thousands of the world's best magazines in full-colour pages or text-only mode and subscription options, but has several flaws including back issue accessibility and speed. Further e-book readers include Wattpad - a collection of digital books published by non-professional writers and distributed free of cost. There are over 100,000 titles to choose from. For programming and coding enthusiasts, eCarrel provides digital books on designing and such. Stanza by Lexcycle and iBooks has been specifically created for Apple products. Not all apps support all formats; hence the need for converters. These range from online converters to downloadable ones. Among these, Calibre and Hamster Free eBook Converter are the top rated, the former being more user friendly than the latter. Now that we know about the apps and formats, the question remains - what do I use them on? You can always use your tabs and smartphone as an alternative to e-readers as they will provide you practically the same options for reading (internet and connection with e-book sellers). Nevertheless, e-readers do come with their specialties - better readability, especially in bright sunlight, and much longer battery life due to its use of electronic paper technology to display content to readers. This technology is not used by any other devices. You can also look out for eboi, an e-reader similar to those mentioned above, owned and distributed by PBS, Shantinagar. 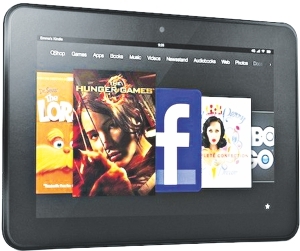 The features include audio and video playing, Wi-Fi connection and ability to read both Bangla and English eBooks. An updated version will be available from January. Till then they are completely sold out. · When buying an eBook reader, you should check the screen type - LCD screens are brighter and more colourful whereas E-ink displays offer more paper-like look reducing eye strain and increasing battery life. Most e-readers have both types. · Choose from the different sizes and weights according to your comfort. · Some eReaders provide more features than others, such as audio playback and web browsing. · Depending on the device, an eReader can have direct access to certain eBook stores, which means extra convenience, a wider selection and also the ability to easily get the latest bestsellers. Kindle for example has direct access to Amazon's online bookstore while Nook and Kobo have access to Barnes & Noble and Borders. For devices that don't have direct store access, eBooks need to be downloaded on a PC first. · It is always best to keep a backup. You can download Dropbox, modi, Mobilime and Sugarsync. These will backup your eBooks and have memories of about 2GB. · Also, check if your eReader is more open or uses proprietary formats. Open formats, such as EPUB, allow more movement of books among devices whereas AZW format can only be played on Kindle devices. · Download more than one app. That way you'll have access to a larger market and be able to read a range of eBooks without the need for converters. Also, if one of your apps is causing problems, you can always use the other. Information: CNet.com, IDB, Bashundhara City, PBS and other websites. Raised by her abusive and neglectful father, 14-year old Lily's life is shaped by one memory - that of accidentally shooting her mother to death at the age of four. Lily grows up lonely with loving thoughts of her mother and hate for her father. In 1964, a period of severe racial unrest, Lily's only friend - a fierce-hearted African-American maid and her stand-in mother - Rosaleen gets into trouble with a group of the town's most violently racist men and is beaten up and arrested. Desperate to not only save her but also to escape her father, Lily breaks Rosaleen out of jail and flees with her to a town in South Carolina that is connected to her mother's past. Three black independent sisters - May, June and August, owners of a bee farm - take them in and Lily's journey becomes a search for the truth about her mother's life, a truth that ultimately shatters her heart and breaks the entire foundation on which she built her life. 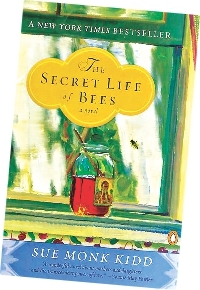 The Secret Life of Bees takes us through Lily's inner struggles, her life, and the challenges she faces growing up and finding happiness in a group of people she was never even taught to look at. This book is one of the most wonderful stories I've read in a long while. It is also probably the easiest-read. I have never read a book written in such simple language with such a delightful mixture of plot, descriptions and characters, filled with beautiful analogies that make it so memorable. There is suspense, sadness, laughter, spirituality, betrayal, forgiveness and so many more elements that blend in with each other in perfect harmony to make a compelling and elegant story. It is a good book for anyone, young or old, and a perfect one for women - unless you're like my mother and can't take tear-jerkers because you don't know when to stop crying.